Katy joined the MVCS team with more than 13 years experience helping families navigate the complex systems of special education and the Department of Health and Human Services. As a coordinator for a diagnostic child development clinic in Central and Southern NH, she managed teams of providers, conducted home visits and observations, spent countless hours in classrooms all over the state working with students and school teams to ensure appropriate educational goals were being set and met. Katy is a founding parent of MVCS and has worked diligently since 2012 to ensure the continued success of the school. Since opening, Katy has been closely involved in all aspects of the school’s operations, has authored many key policies, and consulted regularly with those serving in the Head of School position. She believes in the mission of MVCS wholeheartedly. Katy lives in Rumney with her husband, Josh, son Emmit, who is a MVCS student, and daughter Olive. Alfie joined Mountain Village Charter School with 20 years of education experience. She holds a B.S. in Early Child Development and Young Child Education and graduated from the University of New Hampshire. Over the years, Alfie has helped develop education programs for Georgetown University, National Oceanic & Atmospheric Agency, National Science Foundation, and Head Start. Alfie believes in a shared vision of a world in which "ALL children play, learn, and grow with nature in their everyday.” Alfie is dedicated to supporting MVCS as it continues to grow and stepped in for the 2016-2017 school year and lead as the Interim Head of School. Alfie currently lives in Plymouth NH with her wife, their yellow lab, English bulldog and 2 cats. She enjoys rock climbing and skijoring with her dog. Brianna grew up in New Hampshire and is a member of our founding staff. Brianna earned her Masters degree in Education with a Montessori concentration at Plymouth State University. She also holds a Bachelor of Science in Childhood Studies (from PSU), a State of New Hampshire teaching license for grades Kindergarten through 8th grade and is a certified Lower Elementary teacher. 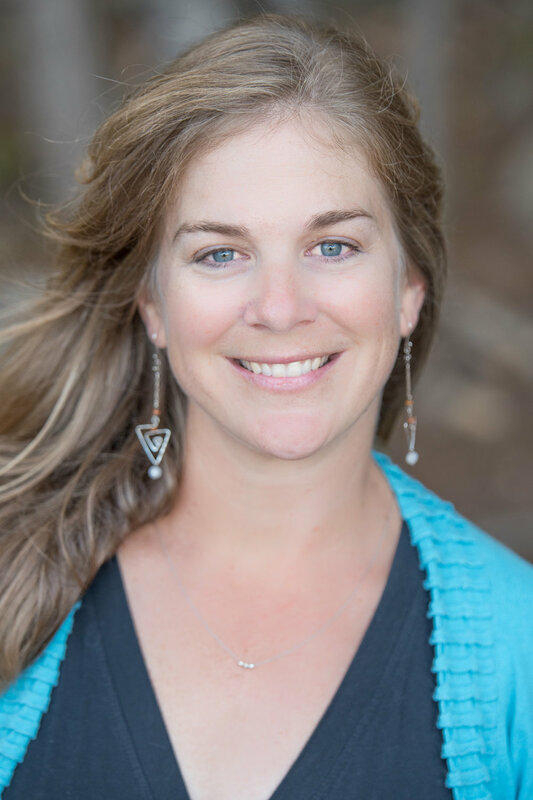 Before coming to MVCS she worked for three years at a Montessori School in Littleton, NH. Brianna continues to explore and learn alongside the adventurous children who spend their days here at MVCS. When Brianna isn't enjoying her time educating her students, she spends time traveling with her husband, Nick. During the school year Brianna lives in Thornton with her husband and their dog, Moxie. In the summer they enjoy van life in the van Nick converted into a cozy home on wheels. Olivia, a native to New Hampshire, grew up playing throughout the White Mountains. Her fondness for spending time in the outdoors and appreciation for nature led her to Plymouth State University. There she earned a Bachelor of Science in Adventure Education and is also a certified Wilderness First Responder. Having worked for various outdoor education programs, she has grown to love how rewarding the experience of learning in nature can be for children. Prior to finding MVCS, it was her work with the Breckenridge Outdoor Education Center in Colorado, that was one of her most memorable teaching experiences. It was at the BOEC where she was a part of making learning and adventuring in the outdoors possible for people of all ages and abilities, through adaptive recreation. Olivia currently lives in the heart of the White Mountains and in her free time enjoys paddling, rock climbing and hiking throughout her local mountains and rivers. Dawn is a New Hampshire native (hometown- Bristol). She has had a variety of experiences and several years of working with young children. Her passion for education was realized while teaching English as a Second Language in South Korea, where she lived for three years. Most recently, Dawn earned an Masters degree in Education from Antioch University New England. She has a passion for place-based and inquiry-based education, and completed her Montessori training in the summer of 2017. When Dawn isn’t pursuing her love of traveling, she most enjoys cooking, vegetable gardening, and spending time with friends and family (which includes her 3 cats). Growing up in the White Mountains region of New Hampshire Madeline holds a deep appreciation for the woods, water, and mountains that surround her home. Madeline attended Lyndon State College where she earned a bachelor’s degree in Environmental Science with a focus on Sustainable Agriculture. Following graduation Madeline spent a year at NorthWoods Stewardship Center where she led outdoor adventure trips and delivered environmental education programs to students all across northern Vermont. It is during her time at NorthWoods, teaching kids about being stewards of our natural environment, which sparked her interest in being an educator. Moving back to the White Mountains Madeline has found Mountain Village Charter School to be an ideal space to continue on her path of nature based education. When Madeline is not in the classroom she is often walking the banks of a river in search of wild trout, rolling down a winding path on her mountain bike, or sliding on snow through the woods. Cristina leads the Brook Trout class with a passion for nature-based and inquiry-driven education. She enjoys integrating ecological literacy across content areas in the elementary classroom, and embraces place-based practices. She holds a Master of Education from John Carroll University, a Master of Science in Ecological Teaching & Learning from Lesley University, and early childhood and elementary licenses in the state of New Hampshire. Prior to teaching at Mountain Village Cristina taught 3rd/4th grade multi-age at a project based charter school on Martha's Vineyard. She has also held a number of positions in the environmental education field including Education Coordinator at Mass Audubon’s Felix Neck Wildlife Sanctuary, Education Director on a non-profit teaching farm, and elementary science teacher at the Greenwich Country Day School in Connecticut. Cristina currently serves on the board of New Hampshire Environmental Educators and enjoys advocating for environmental literacy and nature-based education. Cristina grew up spending summers on Squam Lake and lives in Holderness with her husband and young son. She enjoys reading, kayaking, playing classical piano, and birding, and her favorite animal is a snail. Jim Cruickshank is a native of rural Iowa, where he grew up on the family farm and spent his formative years camping and exploring his local environment. He completed a bachelor’s degree in history from Central College and soon after started his career in outdoor and environmental education with the Houston Independent School Distict’s Outdoor Education Center. Since starting his journey in outdoor education, Jim has completed an M.S. in park and resource management from Slippery Rock University, and worked with a variety of organizations throughout the Midwest and Texas. Jim moved to New Hampshire two years ago to be an educator with Quarrybrook Experiential Education Center and is looking forward to his move closer to the mountains! Jim is passionate about natural resources, conservation, and continuing his own learning every day. He is a Certified Interpretive Guide through the National Association of Interpretation, holds a Wilderness First Aid certification, and is working toward his field botany certificate with the New England Wildflower Society. While not in the classroom, Jim enjoys rock climbing, hiking, camping, and a variety of other outdoor activities. He also likes to relax with a good book or by playing board games with friends. As a recent New England resident, he also enjoys traveling to new places to learn about his surroundings. Jim is very excited to be a part of the MVCS family where he can continue to learn and grow as an educator! Kelsey grew up in New Hampshire, born into a family of farmers, carpenters and animal lovers. Kelsey graduated from Keene State University holding a degree in business management. She is due to complete her Master’s program from Plymouth State University with a degree in Elementary Education in the winter of 2018. Kelsey most recently taught as an Intermediate Tier Teacher leading a multi-age classroom in all aspects of education including: developing literacy instruction for beginning and advanced readers and creating science curriculum for grades 3 and 4. Kelsey has been a certified lifeguard for 15 years and a certified swim instructor or 7 years. Kelsey currently gives back to the community by volunteering as a mentor for the Circle Program and leading a Girl Scout troop in Rumney. Kelsey has been the camp instructor for the Junior Lego Camp, Lego Engineering Camp and Mindstorm at PSU for the past 3 summers. Working with children ages 7-13 she continues to develop her love of science through building and design and in turn, sharing that passion with children and adolescents. Kelsey has honed her love of “all things outdoors” over the years (hiking, swimming, snow shoeing etc) and is thrilled with the opportunity to expand her teaching into MVCS’s outdoor classrooms and beyond! Zoe grew up on the Seacoast of New Hampshire and is now going on her fifth year of living in the beautiful White Mountain region. This has given her a huge appreciation for the diverse and abundant beauty of NH! Zoe graduated from Plymouth State University holding a bachelor’s degree in English and is currently a Graduate student due to complete her Masters of English Education from PSU in the winter of 2019. During her time at PSU, Zoe was also able to serve as the president of the only all-female A Cappella group on campus and be a member of the chamber choir allowing her to travel as far as South Korea with the group! Her passion for education, freedom of expression, and using nature as inspiration led Zoe to MVCS. Zoe most recently taught in Plymouth, in a multi-level classroom working with students with history of trauma in an enhanced residential treatment facility. She has also acted as a counselor and mentor for the New Hampshire Young Writers Institute Summer Program. When Zoe is not in the classroom, you can find her with her bulldog Rosie, practicing yoga, writing poetry, picking wildflowers, swimming, or hiking! Mary is passionate about helping children of all ages connect deeply to nature. Her own nature connection journey formally began in 1993 while studying at Tom Brown’s Tracker School. She was hooked and soon after continued her studies with Wilderness Awareness School and 8 Shields programs. Mary has worked as a classroom teacher and an environmental educator in public and private schools and nonprofit organizations for 15 years. She holds English, Psychology and secondary education degrees from Alma College and Central Michigan University and is a NH certified Language Arts teacher. She is currently working on her M.Ed. in Curriculum and Instruction from PSU. Mary is also a MVCS parent and is so thankful for the opportunities it has afforded her daughter and all its students. She lives on a beautiful, old farm in Warren with her husband John and daughter Joanna where she loves to practice yoga, garden, cross country ski and sit under her special tree and listen to the birds.